Add remarkable color and a floral hint to your bird garden with the Droll Yankees Purple Ruby Sipper Hanging Hummingbird Feeder. The convenient size, lasting construction, and petal-inspired cap make this feeder a welcome dining spot for your feathered friends. The soft purple, polycarbonate reservoir holds 4 ounces of nectar, and the deep red cap captures attention with ease. Three ports on this cap allow a few birds to dine at once, and the petal shapes mimic a flower in bloom. The slightly arched design of the cap keeps water out of the nectar, and the upturned petals make removing this top simple for cleaning and refilling the piece. Rest this feeder in the included hanger, and place several in your yard for a wealth of dining options. The durable construction is fantastic for use for many seasons, and a nectar recipe on the base of the bowl offers a handy resource. 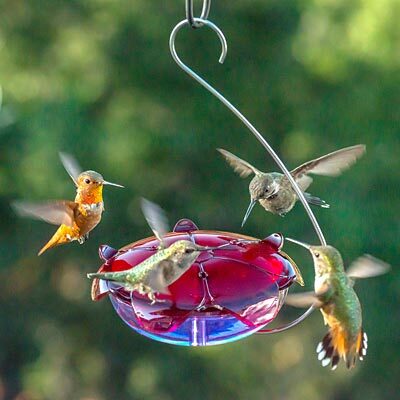 Enjoy brilliant hummingbirds visiting your garden and dining from this Purple Ruby Sipper Hanging Hummingbird Feeder. Made in the USA. Lifetime guarantee.